Daddy’s Favorite New Bedtime Stories! 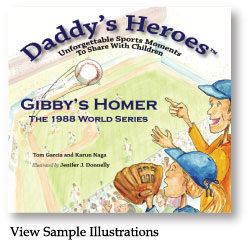 Sports fans will rush home for bedtime stories with Daddy’s Heroes tales for kids about some of the greatest moments in sports history! What a brilliant idea–authors Tom Garcia and Karun Naga have hit one out of the park with their new children’s book series. The inspiration hit one night at Tom’s young son’s bedside when the boy requested a baseball story. He didn’t have any baseball books, so Tom says he told the story of his favorite baseball team–the 1980 winning Phillies. His passion clearly came across as he recounted the most dramatic moments, the boy ate it up, and Daddy’s Heroes was born. –is already available, along with a lil’ shirt that says, "my daddy reads to me". Adorable!